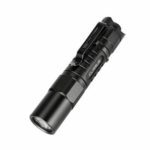 This Duke LED Flashlight is exquisite and lightweight, portable to take everywhere. 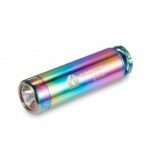 With its strong battery compatibility, you could insert both 14500 AA batteries and rechargeable lithium batteries. The multi-function side switch in head is easy for one-handed operation. In order to prevent turning on the light accidentally, Duke could be locked by sleep mode for a few seconds long press. 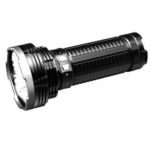 The CREE XP-L HD LED come through the ultra-precise reflector and Double-side AR coated, tempered window, offers Duke a long beam distance. Optimized ultra-precise reflector and Double-side AR coated, tempered window, offers a long beam distance. High-efficiency circuit auto-regulated by temperature and run time. Multi-Function, click side switch provides one-handed operation and easy access to all functions. 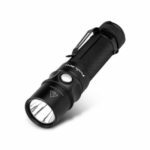 Cycling from normal three modes mid-high-low, you could also easily active the hide mode: strobe-SOS-signal by double click from low mode. Small and shallow reflector is adopted to strengthen floodlighting and expand the illumination range. Boasts a peak beam intensity of 2500cd and a throw distance of up to 100 meters. 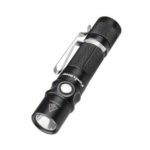 Impact resistance to 1.5 meters and waterproof in accordance with IPX-8 (submersible to 2 meters). 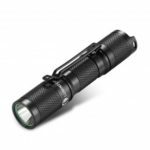 The exclusive half ring buckle design not only fit lanyard and key chain perfectly, also allows the flashlight tail stand as camp lamps.